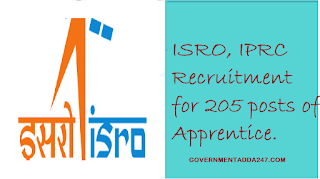 Government Adda 247 Apprentice Government jobs isro ISRO, IPRC Recruitment for 205 posts of Apprentice. 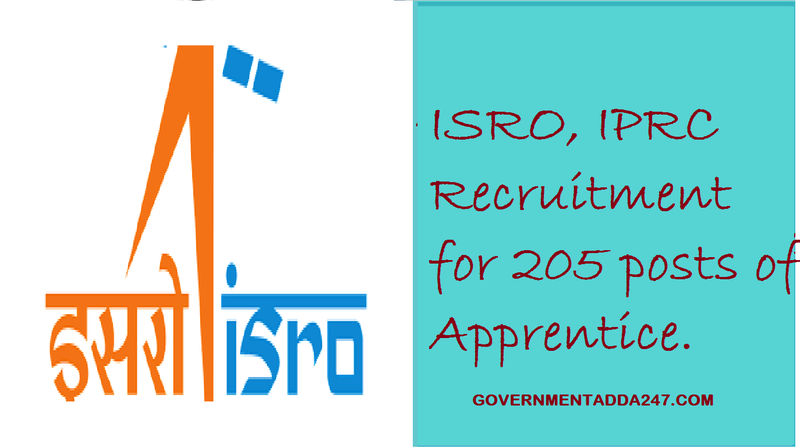 ISRO, IPRC Recruitment for 205 posts of Apprentice. Indian Space Research Organisation (ISRO), ISRO Recruitment Propulsion Complex, IPRC released the notification for the recruitment of various posts as per the notification number IPRC/RMT/APP/2018/01. The total vacancies for the recruitment are 205 vacancies. Interested and eligible candidates can apply for the posts. The post for which recruitment is conducting is GRADUATE APPRENTICE, TECHNICIAN APPRENTICE, TRADE APPRENTICE. Eligible candidates can apply for the post from the date of advertisement released. The interview date for the posts is 29 September 2018, 6 October 2018 and 13 October 2018 and the place for the interview is ISRO Propulsion Complex (IPRC ), Mahendragiri, Tirunelveli District, Tamil Nadu. To know more about the ISRO Recruitment check the information which is given below.